The right-hand portion of this drawing has pencil annotations that are now too faint to read. A triangulation diagram appears on the reverse. 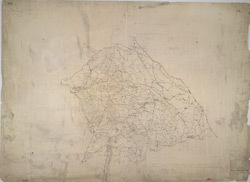 This enabled the draughtsman to plot topographical features of the landscape. There is no hill sketching, suggesting that this is an intermediate version of the plan. Major lines of communication are coloured yellow, following military cartographic convention.